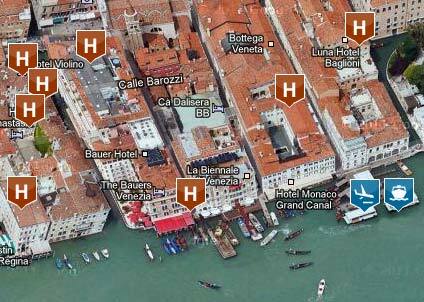 ABOVE: This screen capture shows a small segment of our Piazza San Marco hotel map. Click on the links in the menu below to see interactive, full-page maps of popular hotel areas in central Venice. Each map has icons for transportation (such as airport bus or waterbus stops) and conveniently-located hotels. On each map, you can mouse over the "H" icons to see names of hotels, and you can click on those icons to check rates and availability from our discount booking partner. Hotel icons on our maps identify hotels that we like, or that enjoy high ratings from paying guests. In some cases, the locations of icons may disagree with hotel locations on the underlying Google Maps. When in doubt, you can trust our icons, which we've placed by hand (using a map-editing program) instead of relying on GPS coordinates or "crowdsourced" entries that can be wildly inaccurate. Be aware: These maps work better on PCs or laptops than on mobile devices, and they can be frustrating to load on a slow Internet connection. Our "How Many Bridges to Cross?" hotel listings are a better choice if you're using a phone or tablet.